The US House of Representatives is expected to vote this morning on the Save the Internet Act, HR 1644, to restore net neutrality. Digital rights group Fight for the Future has been hosting a marathon livestream, featuring cameos from from public interest groups like EFF and Public Knowledge, startups like GitHub, Postmates and Gandi.net, and even celebrities like Tom Morello of Rage Against the Machine. The massive burst of attention once again underscores the overwhelming public support for restoring net neutrality protections, and it should give pause to Republican lawmakers who have largely ignored their base on this issue in favor of spewing telecom talking points. 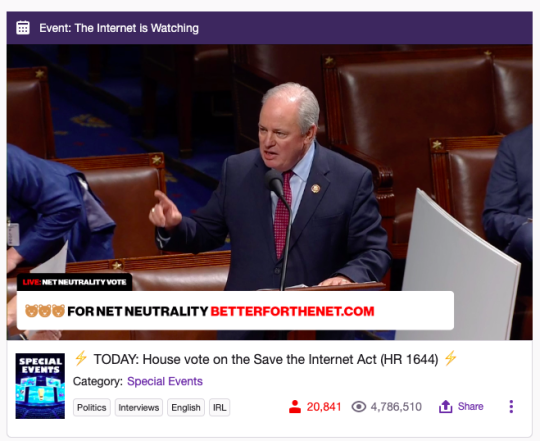 Many commenters in the Twitch chat have self-identified as Republicans in support of net neutrality, expressing disappointment in GOP representatives for their disingenuous opposition to the bill.